Sound_00 is Toni Dimitrov & Lefterna is Boban Ristevski. They are the collaborators who have collaborated on the tracks on this album. It’s not very clear who did what, as the out coming tracks are for sure like a baby between these two artists. 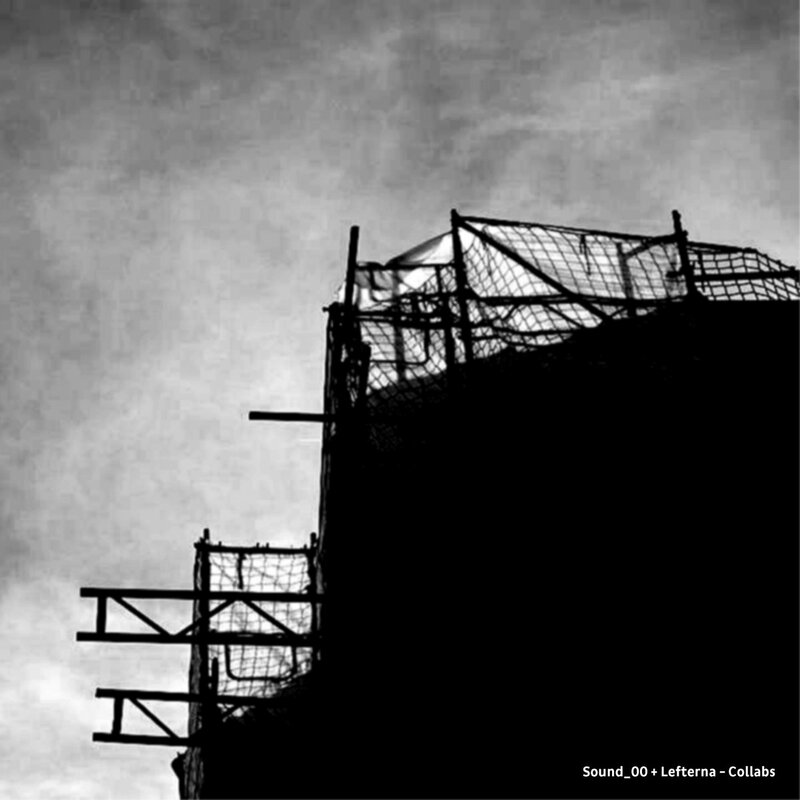 Sound_00 & Lefterna should be a couple of proud parents considering this album..
Collab number one pushes us directly into some hot landscape with a busy singing lady (or ladies), a lot of background noises cluttering the recording like a surreal dream of something that shouldn’t be really fitting together, yet somehow it works in its togetherness. I mean visually speaking my brain sketches a village near the sahara, but then there are all these crispy sounds of fresh forest and birds; perhaps it’s a case of a Fata Morgana in which the green patch with water is real and the sandy savanna just an illusion. Moving on to ‘Collab 3’ which feels intimate. It’s a bit like sitting in that time travelers sink.. Don’t know if you heard that story of this man who found a leaking sink, crawled into the cupboard and kept on going until it became light; and there he had met the older version of himself and he miraculously filmed the two of them on his phone for proof back at home.. It’s on the weird part of YouTube, so it must be true! There is this moment in which some large puddle of water dooms up, might be a river or perhaps the result of indeed a broken pipe.. But as we move along the puddle stays behind and dryer areas are being reached. Perhaps now we arrive at the lost fork and spoon department, hearing cutlery and a little bit of talking… It makes me dream of eating in a restaurant… How long was it ago? 1961? No time to dream all too long as the water leakage seems to return, wetting the place; like a baby peeing in the diaper-changing-person’s face. It’s an endless warm stream, slowly getting more psychedelic in nature; taking the normality of the day down deep into the back of this leaking cupboard experience. Collab 5 – 1 is a soundscape that is more voluminous, going first for that touch of nature night life, you know the sounds of horny bugs advertising themselves for other horny bugs. But when the mood is set, the work really seems to set in something that will make you feel like you’ve just had an encounter with a massive low flying U.F.O. Lighting up this natural environment. The bugs all shut up, and rightly so; this industrial material is producing sounds that seem to manipulate the forces of nature. A heavy storm might be generated, a chance of rain, an even bigger chance of being abducted by an alien light beam straight into the vessel; yet, this doesn’t seen to happen.. Leaving a huge sense of heavenly relief as the alien ship passes along, leaving the sounds of the nature night life to return as nothing had happened before. Then it’s time for Collab 6 – 1, a work that is making me as a listener thirsty. It sounds as if glass, drinking cans, ice cubes, and lots of brewing sparkling bubbles are used to get the sounds exposed in this experimental production. Whether it’s a fuzzy drink or something more heavily; it seems to me that the collaborators have a massive stone table full of it all. Every sound is recorded, giving it a nice gain and echo; making the whole session of opening drinks into something of a grotesque order. It gets bigger and bigger in sound, until a last tonal moment tells us listeners that the exclusive performance has left the speakers. Collab 7 – 2 returns to the night life in a natural habitat. Just when you about to get used to the friendly sounds, the nastiness of the U.F.O. seems to return. Whatever it had been doing before, it had come back and now sounds fully charged like a full massive battery. The spaceship zooms over the environment with screeching noises that are of course fairly alien to the human eye. I expect someone to use this track to play in the back at those ‘strange unexplained noises in the sky’ YouTube videos. It might be a hoax, but hell; it sure gets the viewers in.. This spacecraft sound however large, doesn’t sound so scary. You can clearly hear the nature ignoring its presence, they just keep on doing what they would normally do… For us however it is sound wise a great track to get your binoculars out and keep your eyes out to the sky; who knows that real life alien vessels might pick up the sounds in this collaboration as a distress call, and come down to earth in order to check it all out..
Collab 8′ is up next, bringing the mysterious sounds of alienating jelly beans flashing their neon lights in circler motives. (Sorry, I’m unable to describe it better). It’s a twirling alien sensation, making me feel as if I’ve her sitting extremely long in a fun fair attraction that turns around and around, without ever going the other way; dizziness was the word that comes to mind. It seems to be an endless sensation, perhaps triggering an interesting psychosis in some listeners, and others might be better of preparing a paper bag in case there is a need to vomit. The final Colab is a fresh one, creatively surfing on a smooth hiss like we are a bunch of beach boys and beach girls emerged and overruled by gigantic slow dropping waves. It’s breathtaking how enormous these waves are, and how slow they rise and smoothly drop down.